Forest Grove United Church of Christ, Old Town Church and Emanuel Lutheran partner to provide overnight stays. For most nights of the year, people who are homeless in Washington County are on their own. They sleep in parks, under awnings and in wooded areas. Some are able to stay with friends, at least for a short time. Some have personal vehicles — cars, pickups or camper vans — where they can sleep at night. 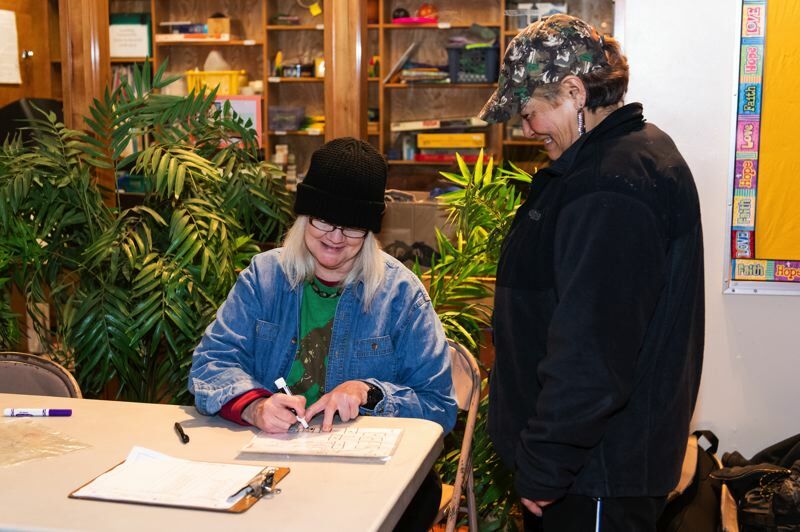 But for four nights per week, from mid-November through March, about 20 people with nowhere else to go can stay in a warm, safe place in the Forest Grove and Cornelius area. For more than 20 years, the Forest Grove United Church of Christ has been offering temporary shelter to the homeless population on cold winter nights. 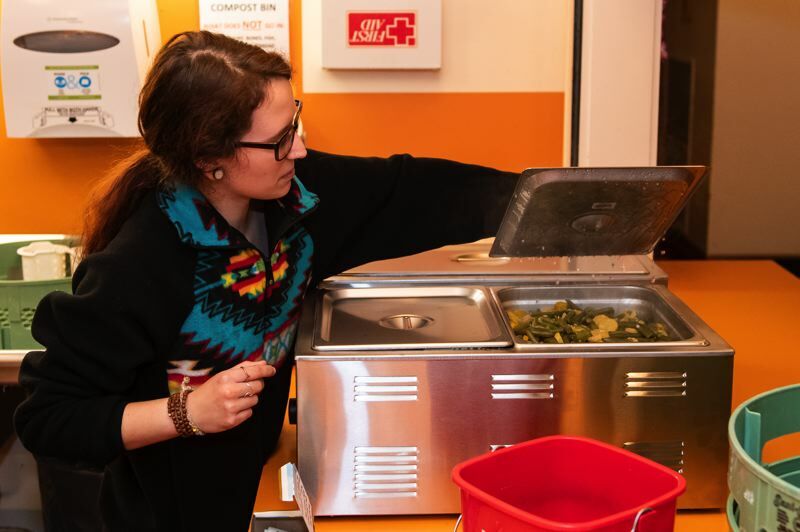 A few years ago, the UCC teamed up with Sonrise Church — now called Old Town Church — to begin providing a shelter on set nights every winter, rather than just opening when temperatures drop below freezing. That stable schedule makes it easier to marshal volunteers and means less uncertainty for people in need trying to figure out where they will spend their nights. "Most of our volunteers are repeat volunteers," said shelter coordinator Celeste Goulding. "Very few people come and volunteer with us and then never come back." 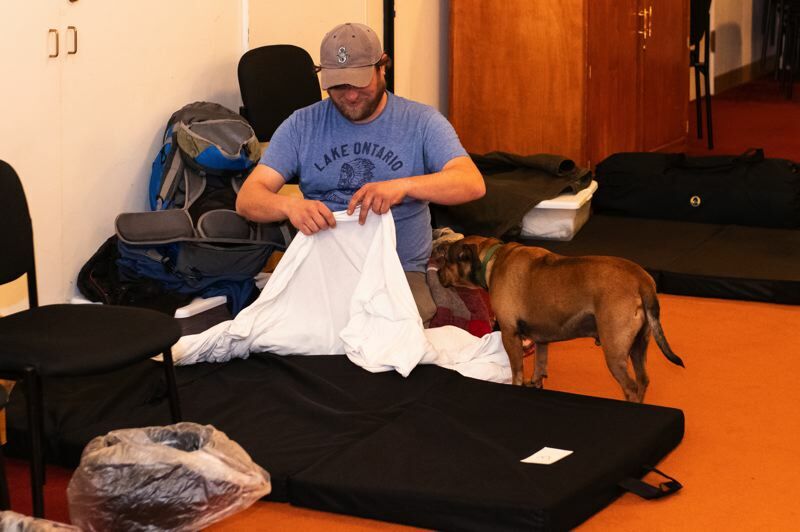 Goulding is one of a handful of paid part-time staff for the Forest Grove & Cornelius Temporary Emergency Shelters, the joint venture between Forest Grove UCC and Old Town Church. The partnership has expanded this year with the participation of Emanuel Lutheran Church in Cornelius, which rents out its space to allow up to 21 individuals and three small families to stay overnight Wednesdays and Thursdays. "They needed a place to house the shelter," said Karl Pishaw, Emanuel Lutheran's pastor. After hearing that Old Town Church was not renewing the lease for the space it used last winter, he said, he volunteered to make a pitch to his church council for Emanuel Lutheran to host: "I brought it to our church council, and much to my surprise, they were very open to the idea and said, 'Yeah, let's pursue it.'" Pishaw sees providing space for the homeless population as a way to further Emanuel Lutheran's mission "to love, work and serve in Christ's name." "We're giving it the old college try this first year, and this will be a proving ground for how it goes, but I'm optimistic," Pishaw said. "I'm looking forward to an extended partnership, and that'd be great." The shelters serve a wide range of people — from their 20s to their 70s, from people who have been homeless for years to people who just recently found themselves on the streets, from single people to families. Not all of them, as one guest observed, "look homeless." And the reasons why they are homeless are varied. Goulding has a master's degree in social work. She is passionate about homelessness and doing what she can to help. She rejects the idea of "'the homeless' as a noun," preferring to view her role as "working with people experiencing homelessness." "Hanging out with them, you'll realize more of them are like you than they are different from you," Richelle Kennon, who is one of the Forest Grove & Cornelius Shelters' other paid staff members, remarked of the shelter guests. "Basically up to 2006, 2007, the top causes of homelessness were addiction or mental health issues," Goulding said. "Since the economic recession of 2007, 2008, the top three reasons people are becoming homeless are ... unmeetable rent costs, extreme medical expenses or personal tragedy." Forest Grove and Cornelius have the lowest and second-lowest median household income, respectively, among major cities in Washington County, according to U.S. Census Bureau estimates. Forest Grove also has the highest poverty rate. "Housing is becoming increasingly unaffordable for a larger sector of our community, and a lot of folks that use these services aren't just people who, for lack of a better term, made bad decisions or found themselves in hard times — but they're people who work, who have families, but just can't afford stable housing," said Ryan Wells, who works for the City of Cornelius as its community development director. He was responsible for reviewing, and ultimately approving, the conditional use permit application allowing Emanuel Lutheran to serve as a temporary emergency shelter this winter. Goulding said she wants to see action on the part of the City of Forest Grove and other local governments to control those housing costs. She grew up in Forest Grove, now lives in Gaston and is dismayed to see how the cost of living in Washington County has skyrocketed. Citing studies by the Oregon Office of Economic Analysis and Portland State University, the Portland Tribune reported last year that the consumer price index for the Portland area had risen 32 percent since 2000 — and the median home price in the Portland area had nearly doubled since 2000, rising by 80 percent. "With the price of housing ... there's a lot of people in our community that are one paycheck away from being homeless," Kennon observed. The same is true of a medical emergency, or any other expensive catastrophe, especially for those who cannot easily afford insurance. Kennon was a volunteer at the shelters for two years before they were able to put her on staff this winter. Now the site coordinator at the Emanuel Lutheran shelter, she works closely with volunteers — including shelter guests who are able and willing. The shelters need people to help set up every night and put things away in the morning. "We don't work them too hard," Kennon said with a smile. Pishaw praised the work that shelter staff and volunteers do to respect the space they use. "If I walked in on Friday morning and didn't know there was something going on on Wednesday, Thursday, I never would have known it, because they clean up so well," Pishaw said. "They're really good about policing themselves and making sure that they get things back in order." The shelters are always in need of volunteers — the more, the better. There are a variety of volunteer opportunities for people: greeting, food preparation, overnight hosting and more. Volunteers typically work in shifts. Learn more or register to volunteer at Old Town Church's website. Pishaw is already planning to volunteer. So is Wells, the Cornelius community development official, who said he wants to have firsthand experience with the way the shelter operates. "I'm probably going to go down in a couple weeks and help serve dinner and see what it's really like," Wells said. Shelter staff also work to connect guests with needed services, Goulding said. This month, through a partnership with Cornelius-based Virginia Garcia Memorial Health Center, flu shots will be available for shelter guests. Through another partnership, guests age 60 and older are being encouraged by Centro Cultural de Washington County to register with the Meals on Wheels People, which provides low-cost meals for elderly area residents. The shelters are always in need of items like disposable cups and plates, packs of bus tickets, and hand-warmers, which they go through on a regular basis. Clothing donations are also welcome, as some guests are not well-equipped for the coldest time of the year. Read about how you can donate to Closet Green, a clothing and household items exchange that supports guests at the temporary emergency shelters in Forest Grove and Cornelius. Brian Schimmel, Old Town Church's outreach director, recently briefed the Forest Grove City Council on ways the shelters are working this winter on positive "outcomes" for guests. That's a term used to describe what condition people will be in several months, or maybe a year or more, down the road. What both shelter and county officials want to see is as many outcomes for people as possible that involve them finding stable housing and becoming self-supporting. "I think you've done a stellar job in trying to pull all of the various strings together to get something done here," Forest Grove City Councilor Tim Rippe told Schimmel. The Forest Grove & Cornelius Shelters operate from 5:30 p.m. to 7 a.m., from Monday evening through Friday morning, for 19 weeks starting Nov. 19 and ending March 29.